V-Go Insulin Pump Launches in Australia! Also launched alongside the t:slim x2 insulin pump at the Diabetes Congress last month was the V-Go disposable insulin delivery device. It’s been available in the US since 2012 through a company called Valeritas, and AMSL diabetes have signed on the dotted line to distribute this baby in Australia. 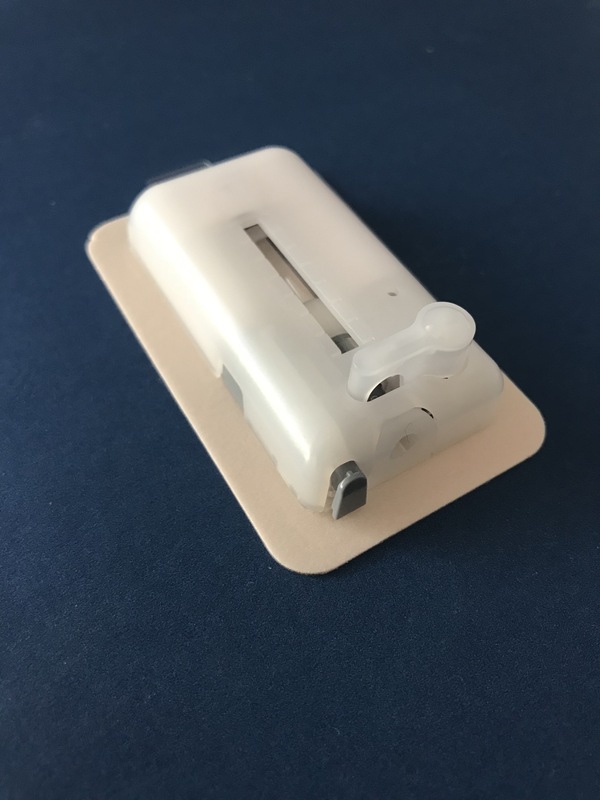 Designed for people with type 2 diabetes, this patch pump holds a 24 hour supply of rapid acting insulin. It delivers a fixed rate of basal in the same continuous fashion as a regular pump, and comes in three different sizes delivering 20, 30 and 40 units of basal insulin respectively. The basal rate cannot be adjusted, and the size you are prescribed will depend on your weight and insulin needs. Each V-Go can also hold an additional 36 units for bolus insulin as needed. Boluses are delivered at the push of a button on the pump itself, with each click delivering 2 units of insulin. If you are on smaller doses of insulin, this pump may not be suitable for you. The pump does need to be replaced daily, which could be a hindrance, although I don’t see why you couldn’t pre-fill a few days’ worth in advance. Any leftover bolus insulin in the V-Go at the end of the 24 hours cannot be reused, so bolus insulin needs are definitely something to be mindful of when pre-filling your V-Go. 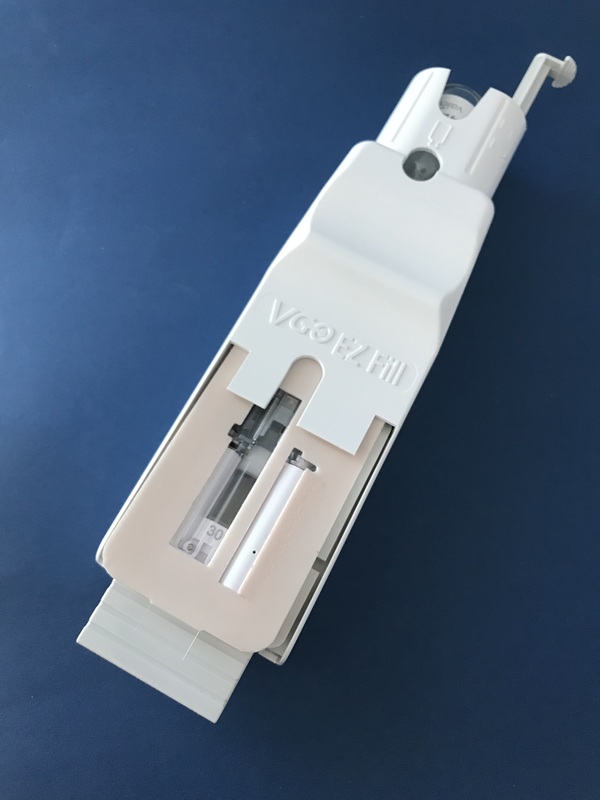 Each V-Go is pre filled with insulin using an Ez-Fill device. 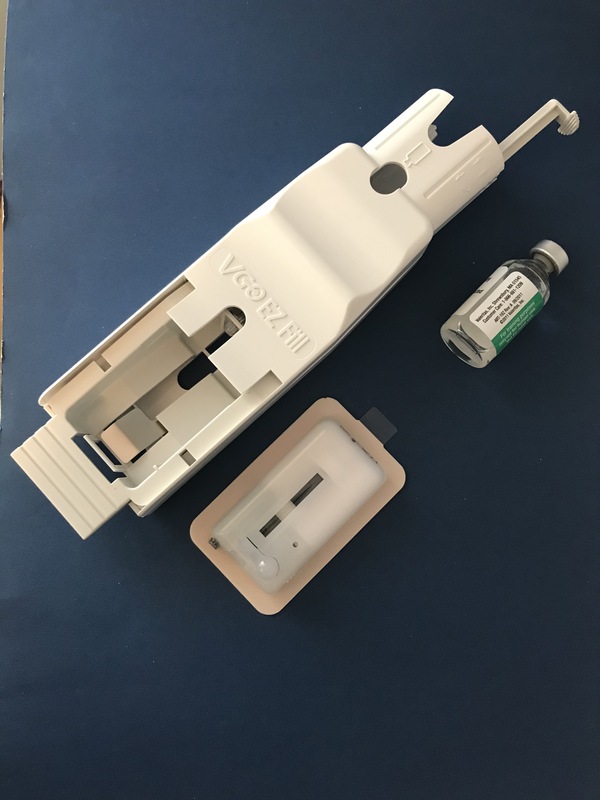 The insulin delivery device slides in at the bottom, your insulin vial sits at the top and then insulin is pushed into the V-Go using the plunger. I am told that the Ez-Fill is designed for use with insulin vials only. Once the device is filled, you simply stick the patch onto your skin. It’s approved for use in the arms, thighs, abdomen or legs. A press of the needle button on the surface will release the needle contained within the pump and commence the delivery of insulin. The needle retracts once you’re ready to remove the device. The V-Go system is sold in a 30 day kit which contains 30 insulin delivery patches and an Ez Fill device. It does seem a little wasteful to include a new Ez Fill in every kit! The V-Go is not currently subsidised through private health insurance here in Australia, meaning that users will have to bear all of the out of pocket costs. The 30 day kit retails for $250, which works out to approximately $8.30 per day. This is considerably more than both Multiple Daily Injections and the subsidised insulin pump consumables we have available to us through the NDSS. However, I do like that this would be easy to trial without a larger commitment if its not for you. Overall I can see why this device might appeal to someone with type 2 diabetes, and also the older individuals who are modelling the device in the demo kit. It’s mechanical in nature and free from any programming. The application looks far easier than an infusion site. Click to bolus looks both easy and discreet. The demo kit also indicated that many people missed their insulin doses due to needles not fitting into their lifestyle. The main criticism I have noted in forums is that this device may not be suitable for people with heavier insulin resistance and larger insulin doses. I was also unimpressed to read so much focus on ‘improved patient adherence’ throughout the demo kit. Language Matters! I am told that people with diabetes are free to complete the V-Go order form which can be found on the AMSL diabetes website. However, users should go through their endocrinologist or diabetes educator to prescribe the basal and get set up. As tempted as I am to trial the demo kit of my own that I received, the fixed basal rate won’t meet my needs as a type one. Although it was suggested that I try it next time I have a pizza night! I also enquired as to whether there was a way to use it for bolus insulin only, but unfortunately there is no way to stop the flow of basal insulin once the needle is released. Overall, I think it’s great to see more options to meet the needs of all people with diabetes. I really do hope that AMSL will try to involve some people with type 2 diabetes in the launch of this product, as they would be better equipped to talk about it than I am. Disclosures: Diabetes Australia covered my travel, accommodation and registration costs to attend the Australasian Diabetes Congress. These are my own views, and not those of Diabetes Australia. AMSL Diabetes hosted me at a bloggers evening during the ADC, which was primarily focussed on the t:slim insulin pump. I was fed and watered across the duration of that evening and received a small bag of stationery. I later visited the AMSL booth in the Exhibition Hall to learn more about the V-Go, where I was given a demo kit of my own to take home. I was not asked to blog about AMSL or the V-Go. My opinions and my time, including the annual leave I took to attend the ADC, are my own.